The 40 Wall Street Corporation was formed in 1929 to construct a speculative skyscraper for the anchor tenant, the Manhattan Company (the Bank of Manhattan). Among the principal investors was the Starrett Corporation, a company owned by the men who were also the building's general contractors, Starrett Brothers & Eken. Architect Craig Severance and associated architect Yasuo Matsui designed a simply ornamented, setback skyscraper with raised brick patterning and cast stone-ornament, and with an elaborate crown and spire in French gothic style. The story of the building's height which topped out at 927 feet above the sidewalk, has become an urban legend. In the real estate boom of the late 1920s many developers sought a PR angle to promote their buildings. In 1929 there was a celebrated "race" to erect the tallest tower in the world. 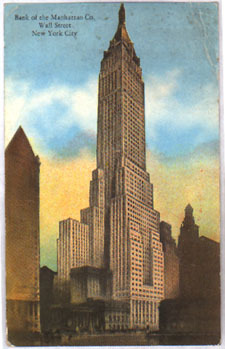 The rival for the title was the Chrysler Building, then under construction in midtown. Adding an edge to the competition was the fact that Severance had only recently dissolved his professional partnership with William Van Alen, the architect of the Chrysler Building. The race between the two towers was avidly reported by the press. Both buildings were topped out within a year of their first steel columns. Van Alen was ultimately victorious, having kept secret the Chrysler Building's 185 foot aluminum spire, erected within the tower's fire shaft. After 40 Wall Street had been topped out, that thin needle was hoisted from inside the tower to bring the height to 1046 feet and the title to Chrysler. Bested, 40 Wall Street went on to a lackluster career. The building opened after the Stock Market crash, and many of the prospective tenants reneged on their leases. The building was not fully rented until 1944, nearly fifteen years after its construction. Its bad luck continued. In 1946 an army transport plane en route to Newark Airport got lost in fog and crashed into the building's fifty-eighth floor, killing all five people aboard. Badly in need of renovation and eighty-nine percent vacant, in 1992 40 Wall Street was purchased by the Trump Organization for less than eight million dollars. With a great deal of investment, 40 Wall Street has been well tenanted since the late 1990s.